Sugar is taking a beating these days. Have you noticed? Studies left and right are accusing this sweet-talking Romeo of seducing us to a life of ruin and heartache. They've applied the words toxic, and poison. Is it really as bad they say? I'm not certain (and I'm not convinced they are, either; my candy munching grandmother lived to the ripe old age of 93). But this I do know. Super refined corn sugar (aka HFCS) scares me. Not only because it cajoles our livers to convert the fructose to belly fat, but because it doesn't agree with me. Period. I knew this the first time I drank a virgin margarita that made me balloon and bloat like a pregnant Demi Moore (and while I concur that Demi was superbly gorgeous in all her fecund glory, in all honesty, I do not desire to emulate such a look- or frankly, such a fertile state- at my tender age of post- let's say- fifty-something). So I took a gander at the label of margarita mix to be sure it was gluten-free. It was. They had changed the sweetener. From cane sugar to HFCS. A quick glance at most bottled beverages, juice blends and cocktail mixes these days reveals the same trend. It's tough to find one without HFCS. So I did what any sensible goddess would do. I gave up margaritas (unless fresh squeezed limes were involved), and I shunned anything sporting the evil HFCS on its label. Obviously not. I bake with organic cane sugar all the time. Why? Gluten-free baked goods benefit from sugar. 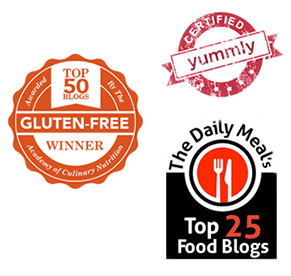 It improves not only the taste of gluten-free flours, it improves texture. It adds structure to vegan g-free baked goods that cannot rely on eggs for volume and rise. It keeps gluten-free cakes from getting gummy and vegan cookies from getting cakey. And powdered sugar makes one killer of a frosting. And here's one more gnarly aspect to chew on. Alternative sweeteners like agave syrup are high in fructose. And you know what fructose does to many of us, right? Yup. It invites the dreaded Demi bloat to the party (it's a FODMAPs thing). Not to mention, the dreaded sugar-to-belly-fat conversion by our poor besieged liver. So while some tout agave and fructose as a way to slow down the postprandial blood sugar rush (fructose does not impact blood sugar levels because no insulin is required to metabolize it; it is transported directly to the liver, and converted to fat), I'm not a big fan. And my waist line is even less of a fan. But here I am. 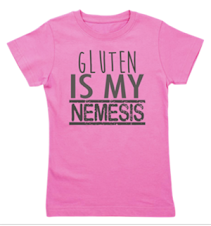 Developing and blogging gluten-free recipes for the sweets you crave. So what do I do? Most of you have no problem with me using organic cane sugar (roughly half glucose, half fructose). But many of you ask me for sugar substitutes. Quite a few of you love agave nectar. Some of you are experimenting with coconut-palm sugar (higher in fructose than cane sugar). In the end- cane sugar- fructose- palm sugar- agave- honey- it's all sugar. One way or another. Sugar that converts to fat and calories. I'm less afraid of organic sugar cane than I am of high fructose (because of the way my body reacts). I will probably continue to bake with it. And eat a sweet treat now and then (I don't eat a lot of sugary treats, truth be told, but when I want a sweet, I'm not going to beat myself up about it). But I'm also willing to try some sugar-free baking. And low sugar baking. 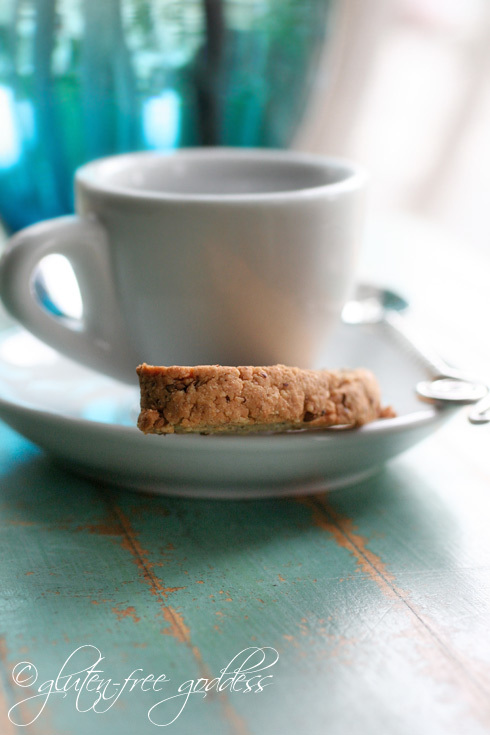 These anise biscotti- this week's baking experiment- are a low sugar treat, a cookie for grown-ups sweetened only with a small amount of pure maple syrup (vegan and fructose-free). They're quite tasty. With a pleasing crunch that won't break a tooth. And they're not too sweet. 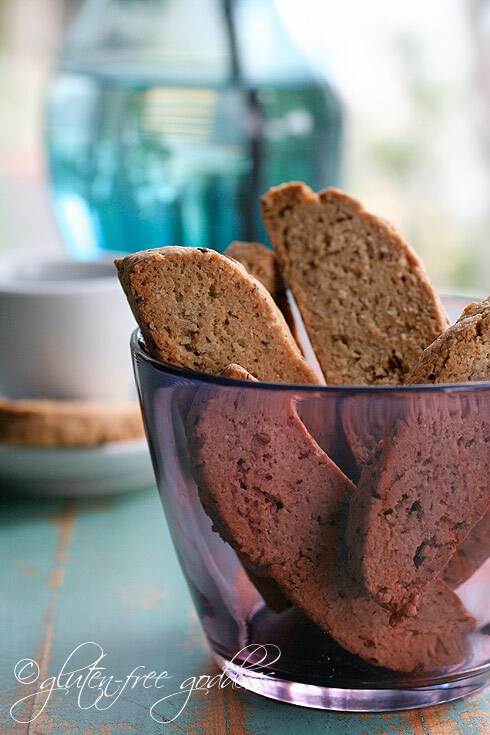 These not-too-sweet biscotti are lovely and simple. They aren't rock hard. They don't crumble. And they stand up to dunking. Yay. Preheat the oven to 350 degrees F. Line a baking sheet with parchment paper or a Silpat liner. Add in the soy yogurt, maple syrup, oil and vanilla extract. Beat until combined and the dough is moist and smooth. It should feel quite sturdy. Scoop and dump the dough onto the lined baking sheet. Using your hands, shape and smooth the dough into a long narrow loaf. Using the curve of your hands, press it down to flatten it into a gently curved shape that tapers down on both sides of the loaf. The loaf should be no more than two inches high in the center. As you press and shape it, squeeze it a bit to keep the dough from cracking. Using a large sharp knife, carefully but firmly slice across the dough horizontally to make 20 cookies. Bake the sliced loaf in the center of a preheated oven for 15 minutes. Remove the pan from the pan from the oven. Carefully separate the slices, and lay each slice on its side, leaving a bit of room between each one. Return the pan to the oven and bake the slices for 8 more minutes. Remove the pan from the oven again and turn the slices over. They should appear slightly golden at this point. Bake for another 8 minutes until slightly golden. Cool the biscotti on a wire rack. They will crisp as they cool. After day one, I recommend storing the biscotti in the freezer. This preserves the texture and keeps them from getting stale. I wrapped the biscotti in pairs, bagged and froze them in a freezer bag. 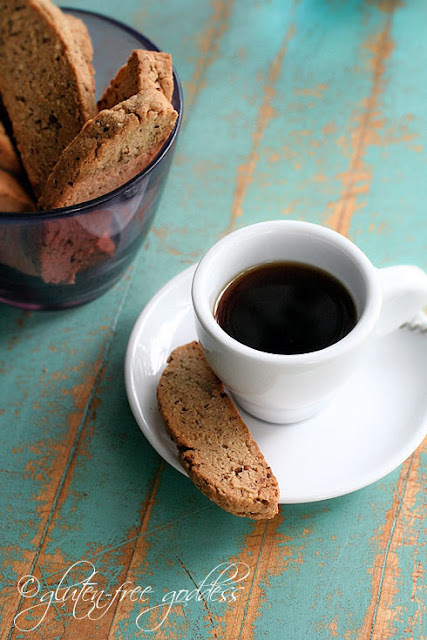 This biscotti recipe is wheat-free gluten-free, dairy-free, egg-free. To make it nut-free, replace the almond flour with certified gluten-free oat flour, or millet flour. To replace any of the other flours, please see my post Baking Substitution Help. These biscotti are not sweet. If you prefer a sweeter cookie, you can add 1/2 cup organic cane sugar to the recipe. You'll also have to add a tablespoon or two of liquid, most likely, to compensate for the added dry ingredient. I would use a non-dairy milk. For those of you avoiding soy, there are other yogurt alternatives. 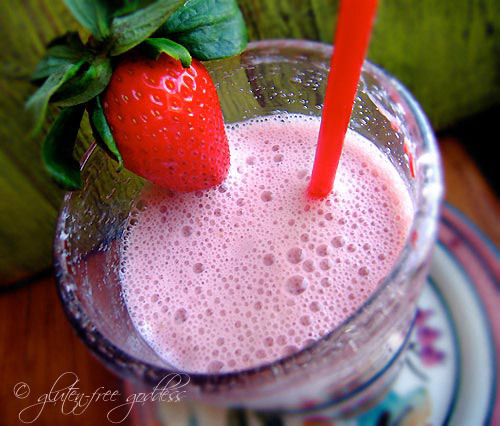 Try coconut milk yogurt, rice milk yogurt, or Mimicreme, a cashew and almond based thick cream. If you prefer to make these biscotti with moo-cow yogurt, feel free. This recipe contains no eggs and no egg replacer. If you want to experiment with eggs, you'll need to adjust the liquids, I suspect. Cut back by half on the yogurt, add two beaten eggs, and see if you need additional liquid. Add only as much yogurt as you'll need to make a smooth sturdy cookie dough. Make sure the anise seed you are using is fresh and aromatic. If the jar has been skulking in the back of your cupboard for a year, you may want to replace it with a fresh jar. The quality of your ingredients impacts taste. If you don't care for the licorice-like taste of anise, substitute it with orange or lemon zest.